Those that make up the largest number in the population are the Baby Boomers, who created a post-WWII population boom, and made up almost 40% of the United States’ population for a time. Decades later, the result of this is that approximately 10,000 people are turning 65 years old every day for the next 20 years. That’s 73 million people, and of this number, 3.8 million at the present time are veterans with a service-connected disability. WSC Construction and Restoration started their business with a passion to serve veterans using the SAH (Specially Adapted Housing) grant program, which entitles those with service-connected disabilities varying amounts of financial assistance to ensure barrier-free living. They provide renovations to homes with compassionate service and superior products — including step-in tubs, stairlifts, accessible shower stalls, entry ramps, toilet incline lifts, and so much more. As time progressed, WSC realized that they could offer a vast array of home mobility solutions not just to veterans from Cleveland, Ohio, to New Philadelphia, Ohio, but also to those with non-service oriented health issues. With their enthusiasm for helping people and this goal in mind, Grab Bars Galore and More was born. They are unique in the fact that there is nothing that they cannot provide and no request that they cannot satisfy; additionally, they offer the most advanced products in each category. With home renovation financing and free home safety inspections available, anyone from Dover, Ohio, to Akron, Ohio, looking for a solution to keeping their senior parents at home instead of in a care facility will be impressed with the options that they discover with the guidance from this local home remodeling company. As people age, they may begin to feel normal aches and pains, but many experience debilitating illnesses that cause their daily mobility to be affected. Whether it’s the result of an amputation from a diabetic complication or the crippling effects of rheumatoid arthritis, Grab Bars Galore and More can assist many in their search for home mobility solutions. Perhaps someone in Cleveland is concerned about their parents’ safety as they attempt to keep their freedom and are hesitant to move from all that they know and love. This local home remodeling company will take the time to go over all the options in the toolkit that they offer that keep senior parents in their homes and help them to maintain their independence. Grab Bars Galore and More offers home renovation financing, as well as a financial comparison of a health care facility in Akron or Dover to remodeling. Entering a nursing home usually suppresses someone’s spirit, so keeping them in their lifelong home with their freedom will be better for their mental and physical health. 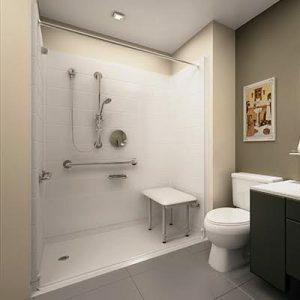 Safety starts in the bathroom since approximately 65% of all senior citizen accidents involve getting off the toilet. Grab Bars Galore and More offers the basic safety need of a toilet incline lift, which combines the functionality of a heavy-duty commode and a lift chair into one convenient bathroom safety solution. They also offer step-in tubs with beautiful and affordable grab bars, as well as accessible shower stalls with steel pipe reinforcement and anti-slip texture for the shower base floor. 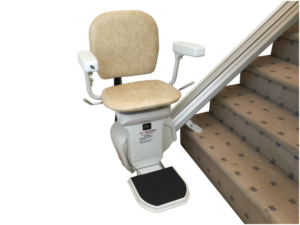 Someone in New Philadelphia may need easier access into their home or to a second-floor bedroom, and this local home remodeling company can offer a wide selection of barrier-free living products, like stairlifts and entry ramps. One of their best qualities is that they can do anything and have access to everything necessary, so they never have the need to outsource the work if they run into any unforeseen issues. Another unique service that they offer is a free home safety inspection, so anyone who is concerned for the freedom of their parents can let this local, female-owned and family-run company shoulder their anxiety and find ways for their parents to live comfortably at home. Establishing themselves as a company that wanted to help disabled veterans, WSC Construction and Restoration morphed into a company that can also accommodate a vast array of options for the general population as Grab Bars Galore and More. They offer a wide selection of home mobility solutions to homeowners from New Philadelphia, Ohio, to Akron, Ohio. Children tend to switch roles with their parents as they age and worry about keeping their senior parents at home as their physical abilities start to decline. Individuals can call this local home remodeling company for a free home safety inspection and a one-on-one consultation to discover the accommodating details of their home renovation financing. 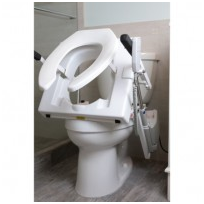 This will provide relief in knowing that their parents can experience barrier-free living with comprehensive services and products — including toilet incline lifts, step-in tubs, accessible shower stalls, stairlifts, entry ramps, and many more options. Anyone from Dover, Ohio, to Cleveland, Ohio, who experiences the compassionate services from Grab Bars Galore and More will understand that they have access to the products and the ability to resolve any situation, resulting in happiness for the parents and less worrying for the children. This entry was posted in Construction & Remodeling, Handicap Modifications, Home Improvement, Kitchen & Baths and tagged accessible shower stalls New Philadelphia Dover Akron Cleveland Ohio, barrier-free living New Philadelphia Dover Akron Cleveland Ohio, entry ramp New Philadelphia Dover Akron Cleveland Ohio, free home safety inspections New Philadelphia Dover Akron Cleveland Ohio, Grab Bars Galore and More, home mobility solutions New Philadelphia Dover Akron Cleveland Ohio, home renovation financing New Philadelphia Dover Akron Cleveland Ohio, keep senior parents at home New Philadelphia Dover Akron Cleveland Ohio, local home remodeling company New Philadelphia Dover Akron Cleveland Ohio, stairlifts New Philadelphia Dover Akron Cleveland Ohio, step-in tubs New Philadelphia Dover Akron Cleveland Ohio, toilet incline lift New Philadelphia Dover Akron Cleveland Ohio, WSC Construction and Restoration by admin. Bookmark the permalink.